While it is by no means the first film to concern itself with a robot possessing human-like emotions, CHAPPIE is one of the best. In the not too distant future, writer/director Neil Blomkamp imagines that the police force in Johannesburg, South Africa, has been heavily augmented by near indestructible robots designed by scientist Deon Wilson (Dev Patel, SLUMDOG MILLIONAIRE). While these law enforcement machines are quite effective, they lack true artificial intelligence, something their creator is actively working on despite being told not to by his boss (Sigoruney Weaver). Deon tries his experimental consciousness software out on a damaged unit, but before he can get the bot up and running he's kidnapped by a gang of small time crooks – Ninja (Ninja), Yolandi (Yolandi Visser), and Amerika (Jose Pablo Cantillo). Originally hoping to learn how to turn the police bots off remotely, something Deon explains can't be done, the gang switches to plan B. They will use the bot Deon has with him to help commit crimes. This will have to wait a few days, though, as a side effect of Deon's consciousness program is that the robot, named Chappie (voiced by Sharlto Copley, star of Blomkamp's debut film DISTRICT 9) by Yolanda, is “born” with a blank slate the first time he's activated after his software upgrade. Deon and the gang will first have to teach Chappie such basics as language, and give him a moral compass of sorts, before he can be sent out on any kind of mission. This can't happen fast enough for Ninja, who is very much aware that if he doesn't come up with 20 million dollars soon, his boss Hippo (Brandon Auret) will kill him. However, Yolandi begins to form a maternal bond with Chappie, even allowing Deon to pay return visits to the gang's hideout and help with Chappie's education. As if this all weren't plot enough, Deon's co-worker Vincent (Hugh Jackman), an ex-military man, has designed a robot of his own. His bot is much more heavily armed but requires direct operation by a human controller using a special helmet. Where Deon's robots, at least without the experimental consciousness program, make their decisions coldly and logically based on data and algorithms, Vincent is certain his would be superiors as a human operator would make them more, well, humane. However, the Johannesburg police are uninterested in further robotizing their ranks with a piece of equipment they see as overkill. Angry and jealous of Deon, Vincent finds a way to make the other scientists bots look bad, setting in motion events that will lead to a violent showdown by all parties. I think that about covers it as far as a plot synopsis goes, but there's even more in the way of big ideas and themes that pop up. The film touches on issues of what it means to be human, the militarization of police and use of excessive force, how children are shaped by the adults in their lives for both good and bad, the nature of God, and the idea of human “transcendence” in which our consciousness might conceivably live on in a computer after death. That's a lot to chew on for a modern day mainstream sci-fi/actioner, but Blomkamp expertly juggles his more profound ideas with the films requirements as pure crowd-pleasing entertainment. The cast is great, too, with Yolandi and Ninja (aka bizarro musical group Die Antwoord, who provide much of the film's soundtrack) acquitting themselves quite well, as does the nerdy looking Patel. These are not your typical lead actors for a mainstream would-be blockbuster, so kudos to Columbia Pictures for having enough faith in Blomkamp's film to not force bigger names on him. Of course some of that may be due to the fact that Blomkamp was able to bring the film in for a mere $50 million, chump change by the standards of today's Hollywood. It certainly doesn't look or feel cheap, though. Are there downsides? Sure. It's a bit hard to imagine technology advancing in a year quite as much as it appears to have here, for starters. And as well as Blomkamp handles all the various characters, plotlines, and themes, CHAPPIE probably has a bit too much on its plate. Considering how many movies barely have one idea worth pondering, or one fresh character worth remembering, I'll gladly take this unwieldy but highly entertaining and thought provoking embarrassment of riches any day. 3 ½ out of 4 stars. 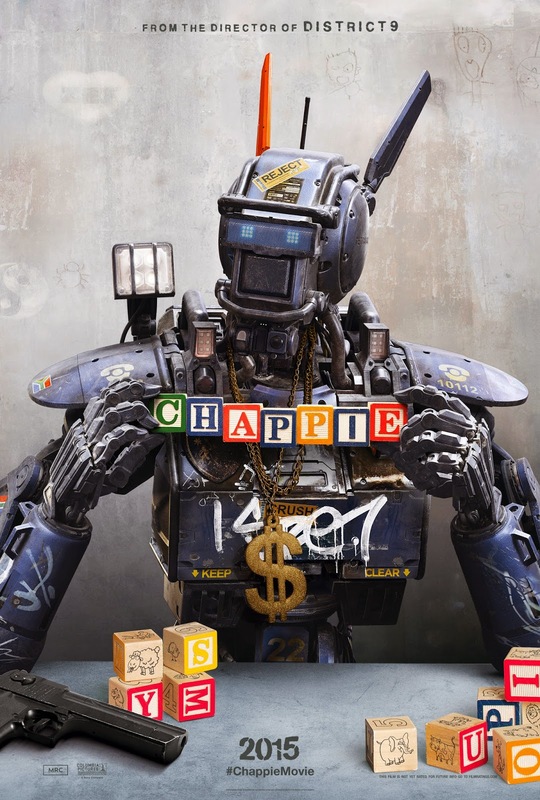 Chappie will make you laugh, it will make you cry. This bot has more personality than any before and hes still learning. Dont believe the reviews this movie will make history I guarantee it. My girls 14 and 16 didnt want to go and see Chappie. They left the theater teary eyed. Knuff Said. Chappie will be a huge hit dont believe the reviews. This movie will make you laugh out loud and cry like a baby. Theres so many points being made in this movie you cant keep track, this movie is a masterpiece. The dark forces are at work to prevent this foreign movie from getting its due. Dont let them go and judge for yourself. My 14 and 16 your old daughters left teary eyed. Knuff Said! This is the best movie bot ever dont let these bad critics that live in a shoe box scare you away pass the word. Free Chappie! Ok overview. Parents not fit to raise a rat, raise a baby. In their highly unothadox parenting way they still manage to teach him values and how to care for family. Even when family puts you under the bus. Whats not to like? I get the sense that you really liked 'Chappie', Nathaniel. Bob I never blog. But when I saw the reviews of a movie that is a work of art I became steamed. Many critics have missed the many lessons tought in this movie. They miss them because all they see is a thug bot, and they instantly dismiss the greatness of this movie. Im a artist and ex proffessional athlete that speaks a foreign language. And in saying that I dont believe most of these so called movie critics dont have the life experience to review a movie. Im just tired of the nonsense. Oh and P.S. my 16Yr old who is African American just recieved a letter from Harvard. Her movie opinion will be unbiased. And Bob no anger twards you your review was solid. I just used your stage. You cant give a opinion on riding a bike when you ve never felt the sensation. Or call Chappie dumb when you have nt seen the results of a child raised in the slums and he grows up with Character. Bob Ive been watching the movie goers opinion of Chappie. Did I get it right? I don't know that there's a "right" or "wrong" when it comes to film criticism. Everyone experiences a movie differently. But for what it's worth, the general audience does seem to like the movie better than most critics, although there have been some critics who have given the film positive reviews as I have. Even '2001: A Space Odyssey' and 'Blade Runner' got mixed reviews when they came out, but over time came to be regarded by most as classics. Time will tell what 'Chappie's legacy is, but I think it has a fair chance of growing in esteem over time. Very well said Bob. Thanks for your reply.